A debate over its nuances misses the point: Incentive-based compensation is broken. (Fortune) -- For the past several weeks I've been asking experts (to be precise: lawyers) if they think the options backdating scandal is a big deal with major ramifications, a medium-sized brouhaha that will fade after the egregious abusers have been punished, or a tempest in a teapot we'll have forgotten by Christmas. Wishful thinking aside, almost nobody believes it's Door No. 3, a scandal-of-the-day wiped out by the next news cycle. The question on backdating then remains: pervasive rot in the system or technical malfunction that needs to be cleared up? My conclusion is the former. So first let's dispense with the pooh-poohers, those who'd minimize the importance of this issue. And they are legion. Options backdating is something of a misnomer, as I've explained in this brief article in Fortune. 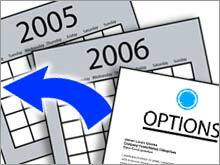 At its worst, the practice is called backdating because an executive manages to move the date of a stock option back in time, presumably to when the stock price was lower. Stock options grant the recipient the right to buy shares at the stated price after a certain period of time has gone by. If the market price is higher than the so-called strike price, the employee makes money. Find a way to lower the price of the grant - by moving back the grant date during a rising market, for example - and the option is worth even more. The scandal, however, involves far more shenanigans, and deeper nuances, than mere backdating. Forward-dating in the event of good news, holding open a grant to see where the stock goes and systematically picking dates that represent a low point in the stock are all variations of how the game is played. Some of the practices could be outright fraud. Some are perfectly legitimate. Sometimes it's just not clear. One of the few things that is clear is that regulators, prosecutors and companies' own audit committees believe there's a problem. More than 80 companies have disclosed investigations of one kind or another into options mispricing situations. Last week the U.S. Attorney in San Francisco charged Gregory Reyes, the former CEO of Brocade Systems (Charts), a computer hardware company, with fraud over alleged backdating practices. If the subject is so complex, then why argue that the whole system is rotten? Consider this: Stock options were invented as a way to align the interests of employees with shareholders. The first time the system began to crack was in the 1990s, when companies with falling stock prices began to re-price their stock options in order to retain their employees. With a righteous fury, arrogant Silicon Valley executives in particular glared at anyone who suggested shareholders would benefit by ending a practice that would lead to losing valued employees. Shareholders, of course, didn't get the opportunity to re-price their shares. The practice halted when rules changes required shareholder approval for re-pricing. Since then, the system of awarding options has gone from an incentive program to an entitlement. Companies that can't or don't offer rich options are at a disadvantage to those that do. Executives - with the complicity of their accountants, lawyers, compensation consultants and boards of directors - game the system to ensure not that employees are working for the shareholders, but rather that employees will make extra money in all but the gravest of circumstances. Options were considered so sacrosanct that Silicon Valley bigwigs fought tooth and nail to avoid having them accounted for as a compensation expense. So here's a radical proposal: Scrap the whole system. Pay employees a competitive and living wage. Pay them more when the company does well but only after shareholders have been rewarded. Do that in the form of transparent bonuses and profit-sharing plans. Outsized riches should be reserved for the company founders, not the hired help, which, let's face it, is what most executives are. But stop gaming the system and then complaining that the rest of the world (capricious regulators, dopey journalists, and so on) just doesn't understand. True entrepreneurs, by the way, the kind that drop out of school, max out their credit cards, eat ramen noodles and risk everything for a dream, won't mind this at all. They don't need stock options to get stinking rich. They have the stock of the companies they start. True entrepreneurs don't need to play games to become wealthy. It's the executives - the people the shareholders hire to look after their interests - who've been reaping entrepreneurial returns that need to be stopped.